This is my dining room, although at the moment it is in complete disarray due to our new found love for legos. They have officially taken over. The dining chairs are still at the reupholsters and have been since March, ugh. That's what I get for going to someone who is a bargain. Anyhow, my dining table which is a square fits the room perfectly and seats 8+, but it has seen better days. 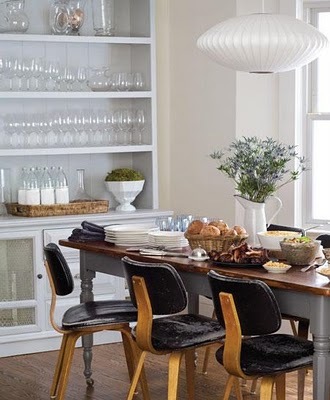 I would love a long dining table, but in reality it just won't fit. We enjoy entertaining so many seats are a must. so I am thinking of giving it a face lift. Over on Vanessa's blog I saw a link to a DIY project that left me speechless. 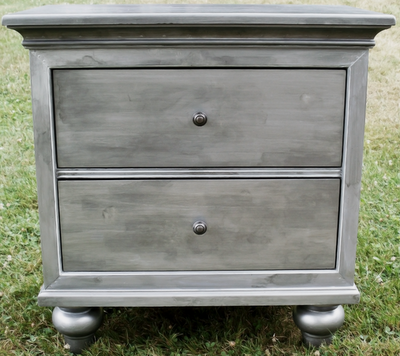 It seems the lady from Freckled Laundry gave an ordinary wooden dresser a faux zinc finish. I personally think its gorgeous and wonder if it would hold up as a dining table top. Does anyone know if a coat of poly would make it last? I think chipping or paint transfer would be worse than my ugly table top. I also thought about leaving the top to ruin and keep the aged look and then paint the legs and apron giving it a more farm house feel. Or my favorite and won't ever happen option is just take off the top and add a slab of marble! Although I am thinking for that price I could just buy a new fabulous table which is something I want to avoid right now. I am thinking cheap. So what would be your pick?